The Zen Garden Bell will complement your Asian-inspired patio or Japanese Garden. Made by our artists, the frame is constructed of substantial 1.5 inch steel tubing with graceful curves near the crossbar at the top and the base below. The Zen Garden Bell is made from an oxygen tank. The stand and bell are finished and painted black. 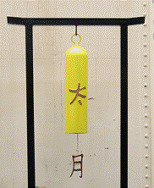 The Chinese symbol for Happiness is cut from raw steel, painted copper and adhered to the bell with the Chinese symbol for Heaven cut from copper (so it will catch the wind) and hanging from the clapper. Stand is 20 inches wide at the base, 30 inches wide at the top and stands 5 ft tall. Garden Bell is approximately 15 inches long by 7 inches in diameter. Due to the handcrafted nature of this piece, variations may occur. Order to shipping time is about 4-6 weeks. Shipping charges are calculated based on what it cost us to ship from our door to yours. Place your order and we will get started on your Zen Garden Bell today.